Moorea may be the most breathtakingly beautiful island that you’ve never heard of. One of the Society Islands that make up French Polynesia, Moorea is located within a 30-minute ferry ride of Tahiti. I strongly believe that the island is a better choice for families; it’s far less commercialized than Tahiti and less expensive and easier to get to than Bora Bora. 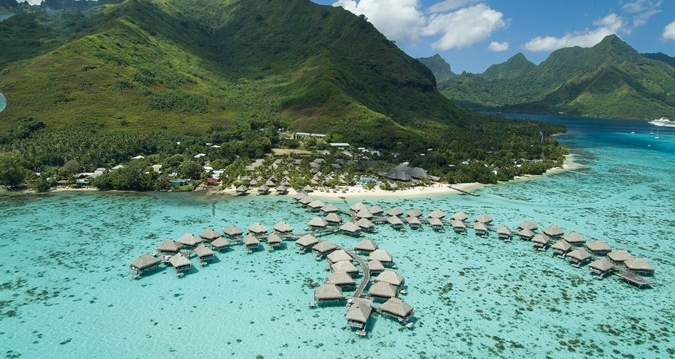 And if you’re looking to live out your dream of staying in an overwater bungalow surrounded by unimaginable, crystal clear water, then the Hilton Moorea Lagoon Resort & Spa is just the spot for your family. The resort offers several different accommodations. Well-appointed garden bungalows, some with private plunge pools, are inland; lagoon bungalows are along the beach. But if you’ve traveled all the way to French Polynesia, don’t cheat yourself! 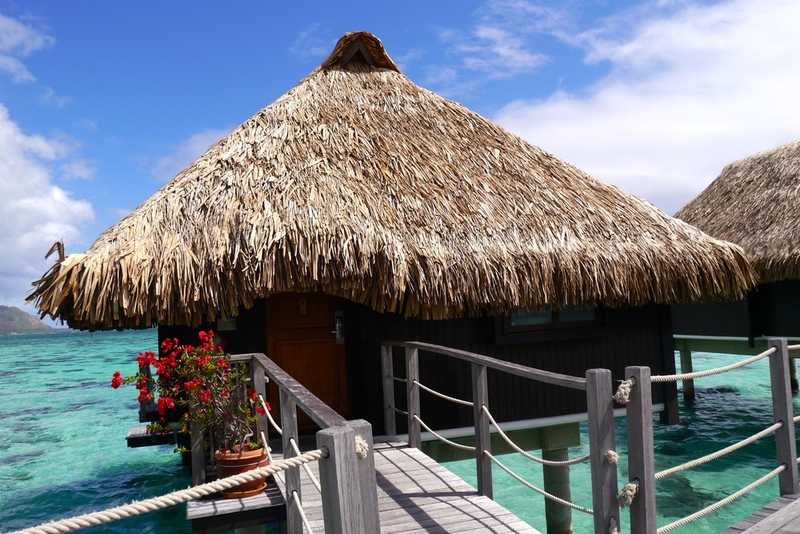 Stay in the Polynesian-style overwater bungalows, built along docks that fan out into the ocean. Our family of four shared a bungalow with a queen bed, roll-away cot, and couch where a two-tiered deck led down to the water. You can literally snorkel out your back door. But you don’t even need to get wet to see sea life; there’s a peek-a-boo glass window in the floor of your bungalow! Even the bathroom - with it’s rain shower and claw-foot tub - has a view of the water. And every evening, you’re treated to a stunning sunset right off your deck. KidTripster Tip: In addition to Moorea, you can find overwater bungalows on these other French Polynesian islands: Tahiti, Bora Bora, Huahine, Maharepa, Raiatea, and Tikehau. These kinds of accommodations also can be found in Belize, Fiji, Honduras, Jamaica, Mauritius, Maldives, Malaysia, Mexico, and Panama. The beach is the star of this resort. Snorkeling, kayaking, paddle boarding, and pedal boats are all included, much to the delight of my boys. It’s best to do the water sports in the morning; depending on the season that you visit, conditions in the afternoon can become very windy, creating a strong current. Unfortunately, water sport activities were closed half of our stay due to wind. But that didn’t keep my kids out of the amazingly clear blue water that’s teeming with colorful fish. The resort pool is large but cold. It’s a lovely spot to enjoy umbrella drinks and a good book. The resort has tennis courts, a fitness center, and a spa, in case you need a break from the water. And if you ask, the pool boys (hotel’s label, not mine) will show your kids how to crack coconuts on the beach. There’s plenty to do away from the resort as well. 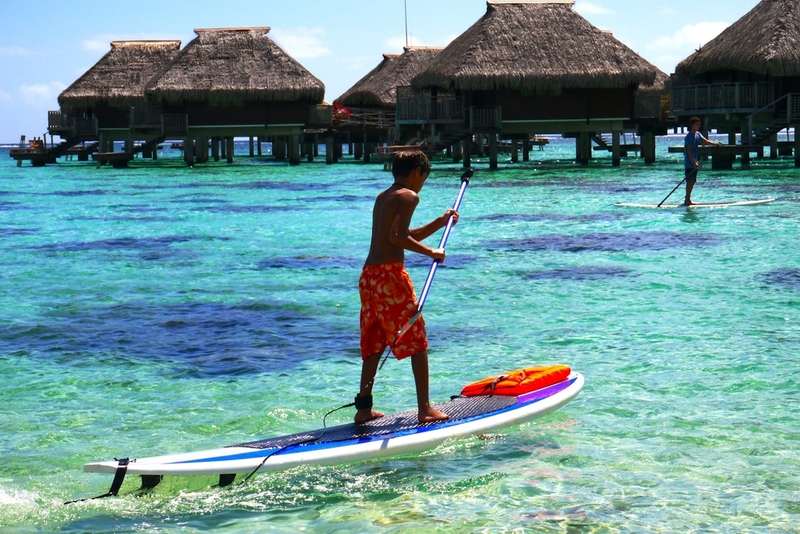 For more on the best family activities in Moorea, click here. KidTripster Tip: Don’t necessarily believe everything the staff at the hotel’s activity desk tells you. The folks working here weren’t particularly helpful or well-informed. For example, one employee discouraged us with misinformation from going to the Lagoonarium. It ended up being one of the best activities on Moorea! KidTripster Tip: Kids don’t eat free at the crêperie, but their meals are half price. Again, you’ll have to remind the staff, as they don’t offer this Hilton Honors discount automatically. Paradise doesn’t come cheaply. You’ll find the best pricing during the shoulder seasons: April to June and September to November. But even then, it’s expensive. An overwater bungalow starts at around $620/night. If you have Hilton Honors points saved up, this may be the place to cash them in. I’d recommend talking with a real live person when you book to make any necessary arrangements for a roll-away cot or bedding for a couch. KidTripster Tip: Check for “stay four or five nights, get one night free” specials when booking. KidTripster Tip: Unfortunately, the shuttle to and from the ferry is not included in the room rate. Look at your bill carefully. We were overcharged for the return trip until I brought it to the front desk’s attention. Overall, could the service and food here be better? Yes, definitely. But you may be willing to overlook it as you take in the spectacular setting from your posh digs. To find out why editor Shellie Bailey-Shah highly discourages renting a scooter on Moorea and other tips, click here.